MTV Star Factory for the iPhone, by GameHouse is an unusual take on the music-themed simulation genre. Instead of focusing on “fun” and “popular” aspects of the music process, such as dancing (as in Konami’s virulently popular Dance Dance Revolution), or performance (as in Activision’s and Harmonix’s groundbreaking DJ Hero and Rock Band), MTV Star Factory focuses on the management and promotion of the talented people who are doing fun things on stage. While music and dancing simulators are effectively electronic analogs for similarly fun and interesting activities, MTV Star Factory departs somewhat from the safety of this model by choosing an odd niche for the basis of its simulation: music management. Instead of pretending to be Green Day or Lady Gaga, you get to pretend to be the guy or gal who hires them and makes them famous. So much to do. Some of it fun. Reminiscent of both Carey DeVuono’s Hollywood Mogul and Zynga’s ubitquitous Farmville, you are put in charge of talent at an up-and-coming record level. A business-saavy, streetsmart young manager, you’re responsible for nearly every aspect of your eerily Nightmare before Christmas-looking bands’ future success, including talent screening, composition, promotion, marketing albums, gigging, and even partying. 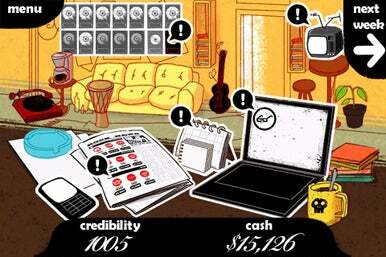 The game’s deceptively-complex interface is organized around a fairly-intuitive central hub, around which various music-management tasks can be taken up. 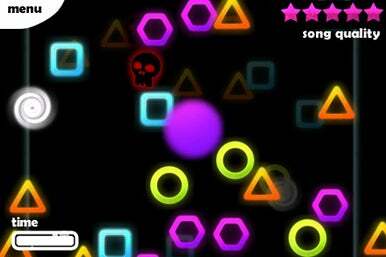 On this score, the game adopts a fairly loose concept of “simulation," covering these different aspects through a series of interesting coordination and puzzle-based mini-games. My favorite of these is that for the composition process, in which to create songs, the player must navigate the artists’ collective subconscious like a kind of Jungian Pac-Man, gobbling up appropriately coherent (and handily color-coded) “good ideas”, avoiding “bad ideas”, and occasionally accessing “Mind Warps” (wink wink) to discover new mental ground. For my band, The Recidivists, I chose to balance our tightly-disciplined electronica sensibility with a raw, uncompromising Big Beat sound. Still, composition is only one of the many tasks that can be given to a band during the turn-based week. Throughout the process of bringing a band from its foundling to lens-flared stardom, you will develop some attachment to your pupil-less, inhuman, musical children. This is guaranteed mainly not by the particular quality of each band, but the sheer amount of work you must devote to each act. While the numerous options for acts and play styles help instill a measure of unpredictability into the equation, this is at least partially diluted by the more predictable experience of the goal-based minigames, such as the composition and studio sections. The chaos is very much controlled and sadly predictable. Additionally, were you to expect some outrageous hybrid of DiG! and Making the Band, you will be disappointed: you will not be able to choke any legends, nor will be able to drop-kick hecklers. Though the reasoning for this creative decision is clear, someone should have let Gamehouse know that without the drug-fueled hijinks and hysterical drama, the music industry can be a boring place.